When an Iraiti ambassador disappears in the US, dictator Maddas Hinsein wants revenge. 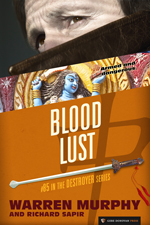 CURE sends Remo into danger as he falls under the spell of the goddess Kali, the Devourer of Life. Without Chiun, Remo may be lost—but if he is, then so is the world.